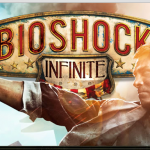 Bioshock Infinite is a much acclaimed first-person shooter game that came out in March. A fantasy set in 1912, it’s the story of a former Pinkerton detective on a mission to rescue Elizabeth, imprisoned since childhood in a tower in an airborne city. Together they fight through the streets of the Utopian city Columbia, and aboard giant Zeppelins in the clouds. The game can be played on the computer, on Xbox 360, and other platforms. Previous versions have won multiple awards. More info at Bioshockgame.com.